So here we reach the third novel featuring that acerbic anti hero Johannes Cabal who this time get's recruited by the mysterious Fear Institute to lead an expedition into the Dreamlands - an alternative reality created by peoples dreams. There they must hunt and destroy the dread Phobic Animus - the source of all fear. I really do love this series, there is such a welcoming charm that immediately disarms the reader and draws them into the world of Johannes Cabal. This time around there is a distinct nod to HP Lovecraft's Cthulhu mythos (hinted at in the past two novels), with a number of direct references, post chapter excerpts from the "The Young Persons Guide to Cthulhu & His Friends" and a subtle under-current that flavours the voice - which I personally loved (Ph'nglui mglw'nafh Cthulhu R'lyeh wgah'nagl fhtagn). The unique style, dry wit and clever dialogue are still present and correct however, as is some very well played situation comedy. I was particularly fond of the "Colossus" in the woods, brilliant idea that was very well executed. The characters themselves are just as gloriously written and lively as ever while the character of Cabal is played to perfection. I really am trying to hold myself back from gushing praise but I really do feel that what we have here is the next Pratchett, the novels are THAT good and this slightly tripped out alternative reality storyline fit's perfectly within both the Cabal style and Cthulhu mythos. There are some really clever twists to reality that do make you think and are used as reflective messages of the real world. 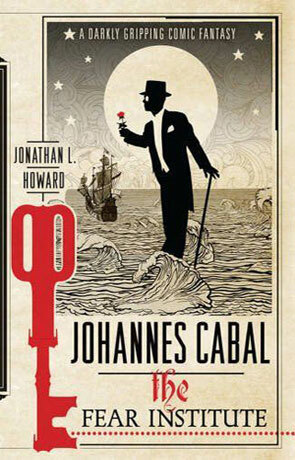 While many books entice you to read to find out what happens, with the Fear Institute I found myself reading just for the joy of it, an unhurried walk through the world of Johannes Cabal that I could have quite happily continued on forever. There is very little back history or exposition with just a few mentions of past events and not only does this ensure a smooth pace but also makes it perfect for those who haven't read the first two books (although I do still recommend anyone and everyone read them). Johannes Cabal the Fear Institute is a staggeringly good book, it's just so much fun to read, darkly witty, charming and oozing with literary allusions, a must read. Written on 19th October 2011 by Ant.